Mostly cloudy. High 82F. Winds SSE at 10 to 15 mph..
A few clouds. Low 66F. Winds SE at 10 to 15 mph. Jalen Cook (14) of Walker High tries to avoid having his shot blocked by Connor Shamlin (3) of Catholic High. Walker High's Brian Thomas (4) drives the baseline with pressure from a Catholic High defender. Walker High's Donald Butler (34) gets a shot off over Catholic High's Collin Holloway (23). Walker High coach Anthony Schiro has guided his team to a 19-9 record against an extremely challenging schedule. WALKER – Walker High left New Orleans with a pair of losses in three games at the prestigious AllState Sugar Bowl National Prep Classic. 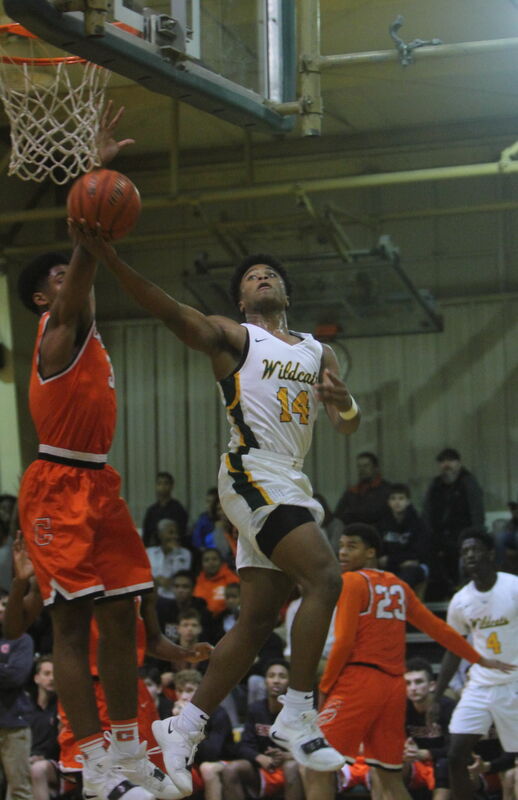 The Wildcats opened the first game of a very challenging three-game stretch this week with a four-point setback at defending Class 3A state champion Madison Prep Academy. That thoroughly pushed Thursday’s home game with visiting Catholic High into another realm, a game the reigning Class 5A state champion Wildcats approached with a greater sense of urgency which the final score revealed. Walker, which led by as many as 13 points in the second quarter, had to continually fend off a determined Catholic High effort down the stretch for a 65-59 victory at Glenn Ellis Gymnasium. Walker (16-8) looks for a repeat of such a performance in Friday’s road nondistrict game against Live Oak at 7 p.m.
It’s the first time the two teams have met since Dec. 8 when the Wildcats defeated the Eagles 68-63 for the championship in the Livingston Parish Tournament. Nobody was tougher than Cook, who scored 19 of his game-high 30 points in the second half, especially down the stretch with Catholic (16-5) breathing down Walker’s neck. The Bears, who went on a 17-7 run to erase the Wildcats’ 13-point lead, tied the game three times over a two-minute stretch of the fourth quarter only to be repelled each time by Cook, who scored 13 of his team’s 19 fourth-quarter points. Cook broke deadlocks of 51-51, 53-53 and finally at 56-56 with a field goal, three-point play and a 3-pointer, the latter of which came with 2:12 left in the game for a 59-56 lead. With 1:55 to go, Catholic had an opportunity to take the lead back, but only got as close as 59-57. The Bears went 1-of-4 from the free throw line after a two-shot foul call followed by a technical against Walker’s Brian Thomas. Walker responded with a steal when Trent Montgomery forced a turnover, which Cook picked up and passed ahead to a wide-open Thomas for a layup and 61-57 lead. Montgomery answered a driving layup from Catholic’s Collin Holloway – only the Bears third field goal of the quarter – with a free throw to make it 62-59 with 1:08 to play. The two teams exchanged turnovers when the Wildcats got a key defensive stand with Thomas, who finished with 15 points, blocking Holloway’s shot near the goal with 32 seconds left. Cook later came up with a key steal where he was fouled and combined with Thomas in the last 16 seconds for three straight free throws to account for the final score. Thomas scored six points and Cook added four to fuel Walker’s 14-0 run in the second quarter that turned a one point first-quarter deficit into a 29-16 advantage with 3:17 to go before halftime. Catholic, who called two timeouts to try and stop Walker’s surge, missed six straight shots and turned the ball over five times during the Wildcats’ run. The Bears answered with an 8-0 run of their own with Kentrell Garnett, who scored 15 of his 18 points in the second half, capping the run with a 3-pointer to cut the Wildcats lead to 29-24. Walker had an emphatic answer, though, getting consecutive slam dunks from Montgomery and Thomas that were 16 seconds apart. Cook then alertly spotted Montgomery ahead of the pack for a buzzer-beating layup and 35-24 halftime edge. Check out these Livingston Parish headlines from January 10, 2019!